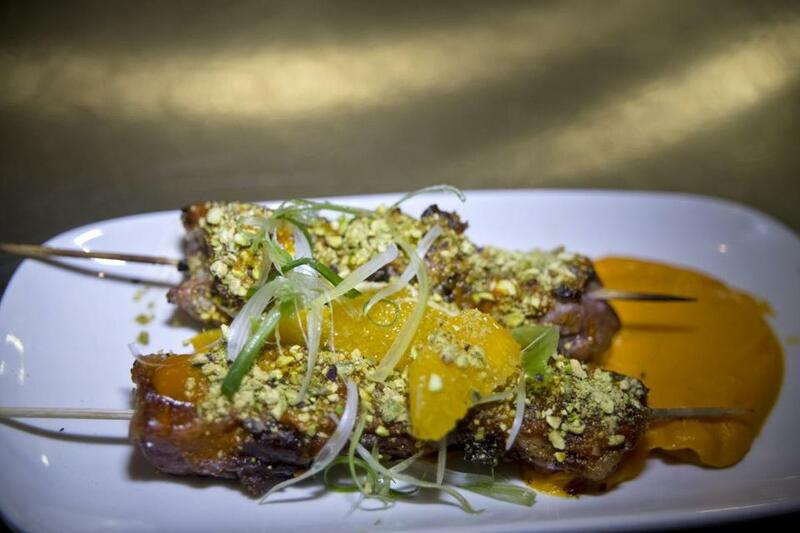 The duck and date kebabs atop of a carrot puree served at Sarma. What for Some of the flavors and creativity of Oleana, in a more casual package and off the beaten path. Sarma, which takes inspiration from Turkish meyhane, or neighborhood taverns, is located in Winter Hill. The space was formerly local institution the Paddock. The scene This was the Paddock? It’s hard to believe. Sarma shares something of the aesthetic of Oleana’s lovely patio, but indoors. It has walls in brick and deep Mediterranean blue paint, Moroccan glass lamps and dangling bare bulbs, tile floors, and banquettes upholstered in bright mix-and-match fabrics. People are also seated on green metal stools at long communal tables, and at the three-sided bar. Co-owner Ana Sortun, executive chef at Oleana and Sofra, chats with customers. Staff members bring around unannounced specials on trays -- these are toted up on a card, a la dim sum. The soundtrack alternates eras: the Marshall Tucker Band one minute, Feist the next. Crosby, Stills & Nash’s “Suite: Judy Blue Eyes” comes on, and when the “doo-doo-doo-da-doo” refrain rolls around, half the bar breaks out spontaneously in song. What you’re eating Chef and co-owner Cassie Piuma’s menu is divided into several sections, such as snacks, sarma, and shish. Everyone seems to be ordering the lamb kofte sliders; no one is ordering the pumpkin fritters because they have already sold out. Other enticing options: seven-layer hummus; harissa BBQ duck kebabs with dates, pistachios, and carrot puree; and Moroccan fried shrimp, sort of a mashup between popcorn shrimp and Vietnamese fresh rolls. Take a soft lettuce leaf; fill with rice noodles, kohlrabi, and shrimp; roll into a plump package; and pop it in your mouth. Care for a drink? Unlike Oleana, Sarma has a full liquor license. Vikram Hegde, formerly head bartender at Island Creek Oyster Bar, is in charge of the bar program. There is a short-but-sweet list of wines by the glass, and beer ranges from the Tap Brewing Company’s kolsch-style Commuter Ale to Boulevard Brewing Company’s Bully! Porter. House cocktails take a cue from the menu, incorporating the likes of sumac, cardamom, and ginger. The Hippodrome -- made with rhum agricole, mastic, sage, and lime -- tastes like a pine-infused caipirinha, fragrant and herbal. 249 Pearl St., Somerville. 617-764-4464. www.sarmarestaurant.com.